H807 – How do others use the model? Indeed Muirhead‘s (2002) book review is readable rhetorical piece which summarize Salmon’s model highlighting again the most important features that should be considered when designing online activities. Pavey and Garland (2004) provided case study of a UK sport science course that used Salmon’s framework to enhance student interaction. I found Figure 1 most interesting seeing what activities were offered at each stage of Salmon’s model. It was also interesting to find out how students experienced the introduction of e-tivities and how helpful or less helpful they found it. The overall results were positive, with students stating how it facilitated a better understanding, increased the level of interaction and reflection on the course material. Only the online tutorial was not valued as a worthwhile experience and student found that is does not substitute a face-to-face tutorials with personal contact. Jones and Peachey (2004) take a more critical stance on Salmon’s model and criticize that the design of stage 2 the online socialization stage is problematic. They analysed the messages posted electronically and found out that the number of messages greatly drop in stage 2. They also refer to students comments who suggested a possible lack of student inspiration. Many students wished to condense stage 1 and 2 to have more time for the other stages. I agree that stage 2 can be limited when an appropriate level of socialization is already reached at stage 1, but participating in the eTrainer course from the adult education center I heard so often from other participants who were novice and relative unexperienced online learners how important it is to meet first face-to-face is to get to know each other and the instructor as well to receive a thorough introduction into the technology. They normally needed both stages and a lot of motivation. Many of them stated that it would have been impossible for them to participate online without putting a face to a name. Well, during my six years study with the OU I never saw somebody face-to-face, but I felt the same anxiety posting my first messages and at this time we did not even had a little profile picture displayed. Personally I think that the critique from Jones and Peachey is a little bit far-fetched. As an instructor I need to be so experienced to observe whether my students still require some more time to socialize or if they are ready to proceed, and I still have the chance to provide individual support and feedback. However, I heartily agree with both authors that there is a growing need for effective training of the tutors who intend to deliver the online courses, because the success of an online courses stands or falls with the (e) skills of the instructor/tutor. Most lecturers focus on content, are experienced in face-to-face teaching, but have little pedagogical training and experience of facilitating learners online, as well as little awareness of issues of collaborative learning. Yet, the development of learning communities who work in collaboration and communicate actively and interactively using the communication tools of the particular VLE (Virtual learning environment) are key factors for the success of online courses. Alexander and Bound (2001 cited in Jones and Peachey, 2005) claim that ‘for effective learning the skills of the moderator are more important than the feature of the software tools being used’. Interestingly Pavey and Garland (2004) found it also important to familiarize tutors with the medium and to convince them of its potential educational value. Sure if you don’t see the advantage you cannot successfully transfer that to your students. You need to be a good role model otherwise online learning will fail. Laurillard’s checklist is also quite interesting and I am sure it is also useful, but I cannot help myself every time checklist go far over 10 points I rather give up on them. Salmon’s five step model sounds more inviting to me. However, I will keep Laurillard’s checklist in mind in case I want to design individualised leaning material, because her model focus on the individual learner rather than the group. Muirhead, B. 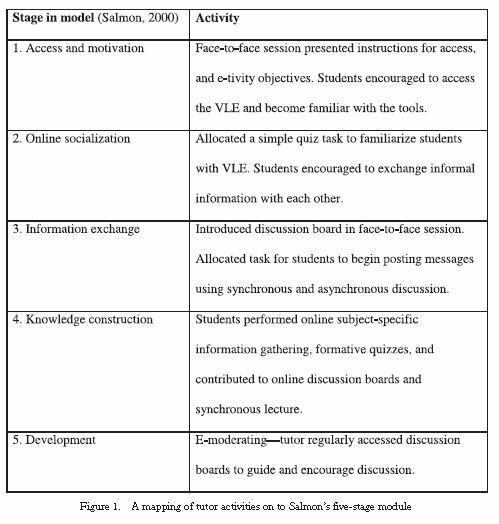 (2002) ‘Salmon’s e-tivities: the key to active online learning’, USDLA Journal, vol.16, no.8 [online] http://www.usdla.org/html/journal/AUG02_Issue/article02.html (Accessed 10 February 2011). Pavey, J. and Garland, S.W. (2004) ‘The integration and implementation of a range of “e-tivities” to enhance students’ interaction and learning’, Innovations in Education and Teaching International, vol.41, no.3, pp.305–15. Jones, N. and Peachey, P. (2004) ‘The development of socialisation in an on-line learning environment’, paper given at the American Educational Research Association Annual Meeting in 2004 [online] http://www.ncolr.org/jiol/issues/viewarticle.cfm?volID=3&IssueID=12&ArticleID=14 (Accessed 10 February 2011). Laurillard, D. (undated) ‘Design process for teaching conceptual knowledge’ in H802 Applications of Information Technology in Open and Distance Education, Milton Keynes, The Open University.